Build a basic all-in-one lab in VMware Workstation. 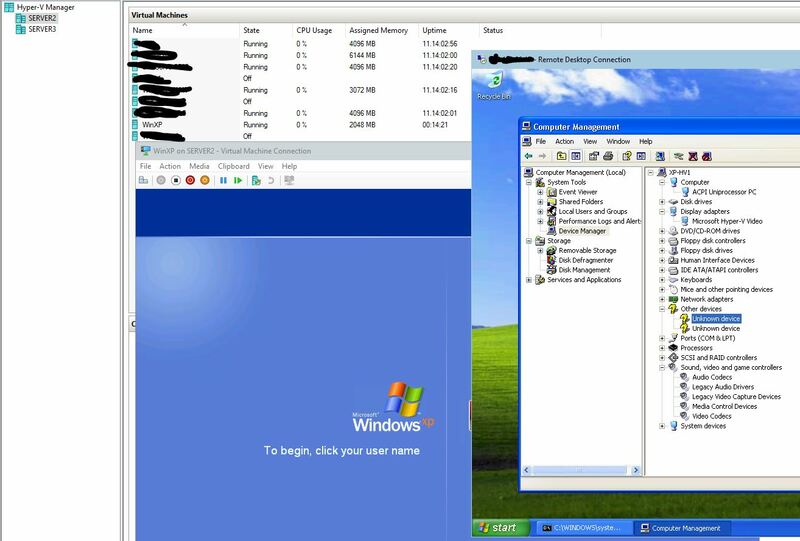 This how-to shows you how to build a virtual Windows Active Directory environment isolated from your home or work network. This is a follow-up to my same procedure in VirtualBox: https://smudj.wordpress.com/2019/01/17/setting-up-an-all-in-one-windows-ad-test-environment-virtualbox-edition/. Note: I’m no AD expert, there are better, worse, and different ways to do this and you’re not required to use VMware Workstation. Download the necessary software. Download the ISO for the OSes you’ll be installing. For this example, I’ll be using IPFire and the MSDN versions of Windows Server 2016 and Windows 10 Pro. Create a folder for your test environment. In Workstation, right-click My Computer and click New Folder. Enter a name like “Allin1 AD” and press Enter. Click your new folder to select it. Click Change Settings, click Yes at the UAC prompt. Click Add Network, select a network. For this example, we’ll use VMnet15. Click OK. Under VMnet Information, verify that Host-only is selected. Uncheck Connect a host virtual adapter to this network. *This will prevent your physical host from accessing the test environment. Uncheck Use local DHCP service to distribute IP address to VMs. *We will use the Windows server’s DHCP and DNS for this environment. Change the subnet address to 192.168.15.0 **Any IP subnet can be used here. To prevent confusion, use a unique IP range. 10.0.15.0, 10.15.0.0, 172.16.0.0 and 172.16.15.0 are all alternative options. Choose an appropriate subnet. For the labs purposes, a 255.255.255.0 subnet is acceptable. Click Apply. Verify your settings for VMnet15 and click OK.
Click File–>New Virtual Machine or CTRL+N. Select Custom and click Next to begin the New Virtual Machine Wizard. Click Next, the default hardware compatibility is fine. Select Installer disc image file (iso) and click Browse. Go to the location from step 1.3 where the IPFire ISO is located. Select the ISO and click Open. Select Linux as the guest OS and click Next. *IPFire is built from scratch and not based on any Linux distro. One processor is enough for our IPFire router, click Next. Network type. Select host-only networking and click Next. Click Next to select the default I/O controller type. Click Next to select the default disk type. Click Next to create a new virtual disk. Change the disk size to 4GB and click Next. *2GB is the minimum, 4GB is recommended for logs and add-ons. See 4.9 above. Click Next to accept the default disk file name and location. The new network adapter, network adapter 2, will be selected. Select NAT or Bridged for the network connection. **NAT will provide a more isolated environment, where bridged will allow the IPFire VM an IP address on your host’s network. NAT will be used for this document. Click Advanced. Click Generate under MAC Address. Make note of this address. 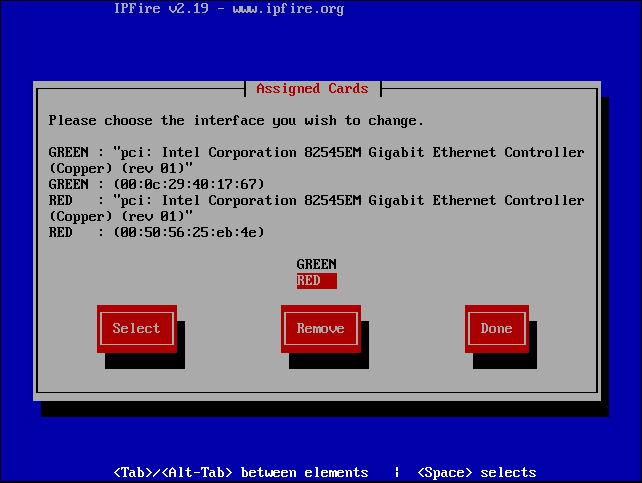 We will need the address when assigning network types in the IPFire installation. Click OK.
Click Custom, select VMnet15, click OK. Drag the IPFire VM into the folder created in 2.1 above. Click Power on this virtual machine. Click the IPFire splash screen and press Enter. Press Enter to accept the default language selection. Press Tab, press the spacebar to select I accept this license. Press Tab again and press Enter. Press Enter to Delete all data. Press Enter to accept the default file system. Press Enter to select the default keyboard layout. Change the timezone. For this document PST8PDT will be used. Press Enter. Root password. Enter a password and press Enter twice. Press Enter to continue. Enter a password and press Enter twice. *this is for the admin password, it can be the same for simplicity. Use the arrow key to move down to Drivers and card assignments, press Enter. Green — This is our internal test environment network. It will have no direct access to the Internet or the host’s network. Compare the MAC addresses and use the one that was not generated in step 4.16.3.2. Use the arrow keys to select the correct interface and press Enter. To move between fields, use the Tab key. Red — this will allow the test environment external access via the NAT network. Use the arrow key to select Red and press Enter. There should only be one interface left to select. Press Enter. Both network cards should now be assigned. Use Tab to move to Done and press Enter. Tab to Address Settings and press Enter. Press Enter to reconfigure the Green interface. Press Enter to acknowledge the warning. We are not connected remotely, so this does not apply. Since we are using the 192.168.15.0 subnet, we will assign a 192.168.15.1 IP address to the Green interface as it will be our gateway IP address. The default subnet mask does not need to be changed. Press Enter three times to accept the IP, subnet, and return to Address Settings. Use the arrow key to select Red. Press Enter. The Red interface will get an IP address from Workstation’s NAT. Using the arrow keys and spacebar, select DHCP. Use Tab to move to OK and press Enter. Use Tab to move to Done and press Enter. DNS and Gateway settings are only needed if using a static IP. Since we are using DHCP, there is nothing to change here. Tab to Done and press Enter. We will be using Windows DHCP so we do not need to enable IPFire’s DHCP server. Tab to OK and press Enter. Setup is complete. Press Enter. Login with root and verify that you can ping an external IP address like 4.2.2.2 or 8.8.8.8. Press CTRL+C to break the ping. If unable to ping, verify the network configuration is correct above. 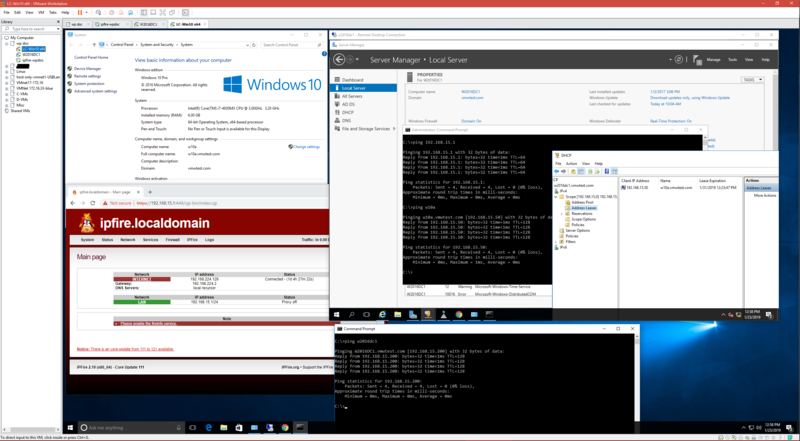 Create a Windows Server 2016 VM. Press CTRL+N, select Custom, click Next. Select Installer disc image file (iso) and click Browse. Go to the location from step 1.2 where the Windows Server ISO is located. Click Next to skip the Easy Install Information. Click Yes to accept the product key prompt. Click Next to select the default BIOS. Select One Processor and Two Cores. Click Next. Select use host-only networking and click Next. Click Exit virtual machine settings. Enter the IP information. The IP needs to be on the same subnet as configured for the GREEN network. EX: 192.168.15.200, GW: 192.168.15.1, DNS: 127.0.0.1 since we’ll be creating a domain controller with DNS and DHCP services. *Remember to use the IP address entered in step 6.11.3 for the gateway address. You should be able to ping an IP address like 192.168.1.15 and 4.2.2.2, but not a DNS name. Change the name of your server and reboot. When asked to configure scop options, verify “Yes” and click Next. WINS does not need to be configured at this time. When prompted to activate scope, verify “Yes” and click Next. You will get a certificate error when accessing the IPFire management page. Add your Windows Client OSes. 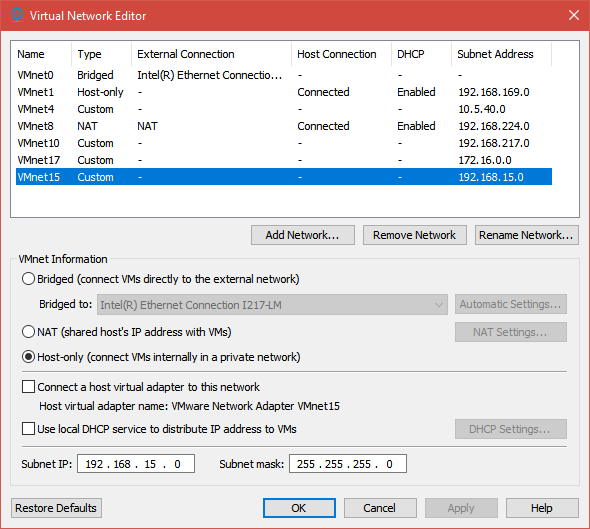 Install Windows as usual, make sure to set your VM’s network to the custom VMnet15. Also included are bug fixes, security updates, and performance improvements.